W Hotel Sky Lounge | Washington, D.C. Located atop the historic W Hotel in Washington, D.C., the Sky Lounge was designed to have a monolithic floating appearance, dramatic surface movement, and even backlighting of all horizontal and vertical surfaces. GPI engineered, manufactured, and installed backlit honey onyx with precision mitered inside and outside corners, eliminating all visible steel or wood supports. Durability of the onyx surface and overall structure was a main concern for this high-traffic bar; the cantilevered portions were reinforced for stability. Bar top cut-outs were fashioned to serve drinks and raw bar appetizers from removable ice-laden bins. 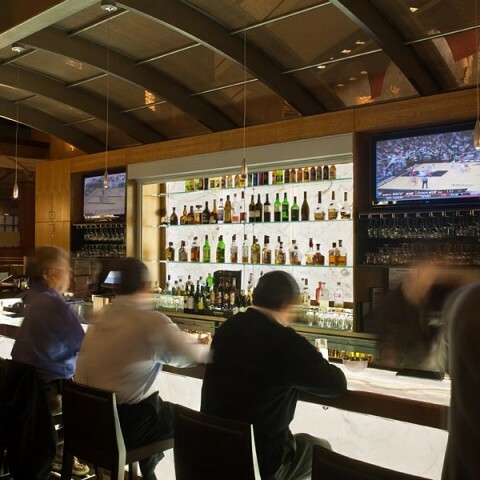 Infuse™ Flat-Lite™ LED panels keep the backlit stone bar evenly illuminated yet cool to the touch. 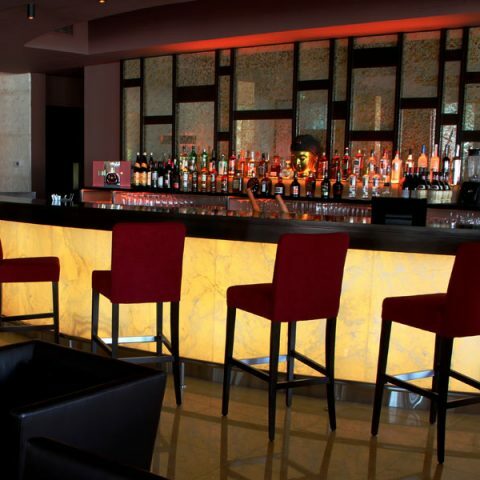 The sleek monolithic cantilevered backlit onyx bar sets the chic mood at the rooftop bar.